We are launching in May 2016. Follow our telegram channel for updates! 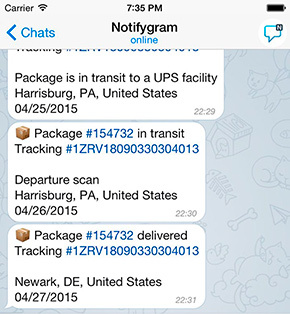 All messages are encrypted with MTProto Mobile Protocol. Notifygram doesn't store any data you send. All messages are > /dev/null after sending. 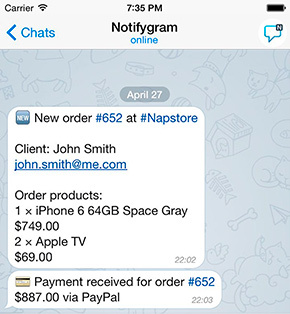 There are no limits on users and sent messages. Send as much notifications as you like. 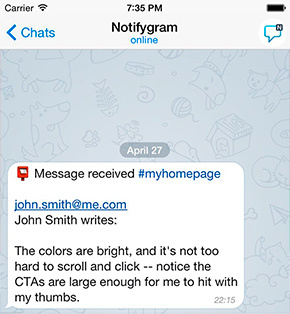 You can use Notifygram in your projects. API supports POST/GET requests via HTTPS. Ready modules using API are available on GitHub. Use API documentation to develop yours.